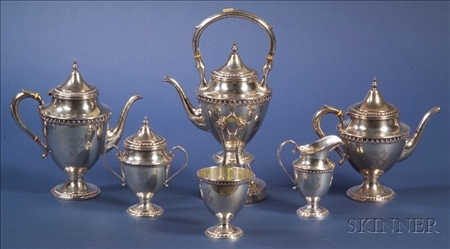 Six-Piece Classical Revival Sterling Tea and Coffee Service, Ellmore Silver Co., mid-20th century, comprising urn-form teapot, coffeepot, creamer, covered sugar, open sugar, and kettle on stand with burner, with gadrooned rims, peaked lids, monogrammed, coffeepot ht. 10 3/4, approx. 113 troy oz., sold together with an associated silver plated tray, lg. to handles 28 3/4 in., (7 pieces total).